The New Mexico eviction notice forms are needed in the event that a landlord seeks to have a tenant removed from the premises for any legal reason. Reasons to remove a tenant can include for non-payment of rent, breach of agreement, or because a tenant has stayed beyond the lease term. In New Mexico, a landlord has to give notice to the tenant about his or her intention to seek legal redress if tenant fails to cure the breach. A landlord can go to a New Mexico Magistrate Court and file a Petition by Owner for Restitution. If landlord prevails in court, and tenant still fails to move out, landlord can ask the court for a Writ of Restitution to obtain the authorization for the sheriff to assist in moving the tenant out. 3-Day Notice to Quit (Non-Payment of Rent) – Also known as Form CV-105, is to be used to inform tenant of his or her failure to pay the rent on time. The tenant will have three days to pay or move out before landlord seeks legal action. 7-Day Notice to Quit (Non-Compliance) – Also known as Form CV-106, is to be used when a tenant has breached the lease contract other than non-payment of rent. Tenant will have 7 days to respond or move out. If it is a second (2nd) violation of the same non-compliance, then the landlord will have the option to terminate the lease and offer the tenant thirty (30) days to move-out. 30-Day Notice to Quit (Month to Month) – Also known as Form CV-108, is to be used to inform a tenant that the lease will not be renewed at the end of the term and that they have 30 days to move out. Rent is due to the landlord on the date specified in the lease. If it is not paid by that date, it will be considered late and the landlord can seek redress. Step 2- If tenant fails to rectify the problem or move out in response to the landlord’s notice in Step 1, landlord may then go to the local magistrate court to file a Petition by Owner for Restitution and a summons with a fee of $77.00. The summons and petition must be properly served on the Tenant. It cannot be served by the Landlord. It is probably a good idea to have the sheriff serve the papers. It must be served at lease 7 days before the court hearing. Step 3 – If tenant fails to show up at the hearing and/or the landlord is successful in his or her case against the tenant, the court will issue a judgment of restitution and give the tenant a date to move out which will be no more than seven days from the date of judgment. If the tenant still fails to move out. The landlord can ask the court to issue a Writ of Restitution and then the sheriff will be authorized to remove the tenant. The New Mexico Notice To Quit form is available for download by clicking the PDF, ODT, or Word buttons. Before filling out this form make sure you have the Lease Agreement between the Landlord and Tenant available for reference. It is important to establish who this Notice is addressed to. This may be done on the empty line following the word “To.” If the Name of this individual appears on the Lease itself, make sure to provide a precise transcription. Review the lease as there will be some information that must be presented on this document from it. First, in the sentence starting with “The premises herein referred…” enter the Leased Property City on the first space. In the second space, enter the Leased Property’s County. In the third space, enter the Zip Code of the Leased Property. Finally, using the last two spaces fill in the Building/Street and Apartment Number. Next, fill in the Day, Month, and Year reported as the Lease Signature Date, in the first, second, and third spaces respectively. You may issue the Tenant a “Nonpayment” Notice by marking the first check box. You will need to fill in the Name of an Authorized Agent and the delinquent Rent Amount the Tenant has not paid in the first sentence. Then in the second sentence present the Amount of Past Due Rent the Tenant must pay and the Rental Period associated with this Past Due Amount in the appropriate areas. If this statement is selected the Tenant is given Three Days to Pay this Amount or vacate the Leased Property. You may issue the Tenant a “Noncompliance” Notice by marking the second check box. This will give the Tenant exactly Seven Days to cease violating the Lease, remedy the problem, and become compliant with the terms he or she agreed to or allow the Landlord to retake possession of the Rented Property. 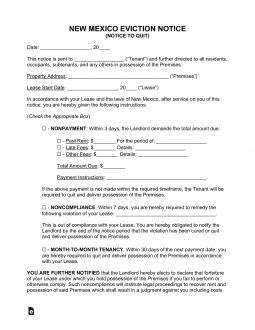 You may issue the Tenant a “Month To Month Tenancy” Notice by placing a mark in the third check box. Then enter the intended Termination Date of the Month to Month Tenancy on the blank spaces provided. This Date must allow Thirty Days or more between the receipt of this Notice and the last day of the active lease. You may issue the Landlord a “Month To Month Tenancy” Notice by placing a mark in the fourth check box. When selecting this option, make sure to enter the exact Date the Lease will be terminated by entering the Calendar Day, Month, and Year of the termination date on the first second and third spaces. The paragraph at the end of the Month to Month Lease Landlord/Tenant Termination area will apply strictly to the intend of the Landlords, Owners, or the Agents of these entities. If this Notice is being issued by such an entity the Landlord/Agent Signature line must be Signed by the issuing party. The agent delivering the document must verify when it was delivered, who it was delivered to, and how it was delivered in the “Certificate of Service” section. There will be a Signature Line at the bottom of this section which demands the Signature of the Delivering entity to validate this paperwork’s delivery. If this Notice and its accompanying paperwork was delivered by hand to the intended recipient then, select the first check box. If left with a second party who may be reasonably counted upon to continue the delivery to the intended recipient then, mark the second box. The last check box indicates the Notice had to be delivered through First Class Mail (USPS).